I ended up plaything more NBA Live than 2K last year, not because it was the best game, but because it was the more fun game. Well, EA has sealed the deal on my day one basketball game purchase for this year. Yes, I am sad enough to buy a game based on there cover athlete, and Joel Embiid is the bomb. Couple of videos showing that the game has progressed pretty damn well. The excitement for this game is palpable. NBA Live 19 Demo drops tonight at midnight eastern time. Last, but not least, let’s talk about Live Run 5v5 competitive play. 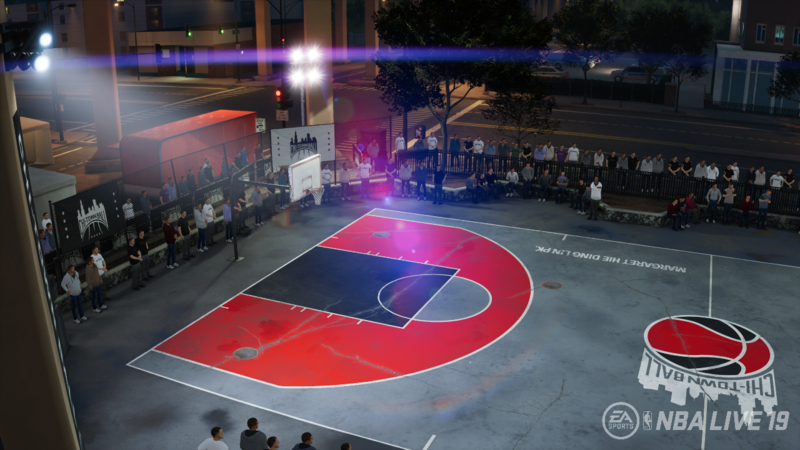 Maybe not too surprisingly, when we introduced 3v3 in Live 18 we saw a lot of Live Run players move over to this mode. This made us stop and think about how we want to differentiate these two experiences inside of Live Run. Rather than it just being about the number of players on the court, we decided, let’s really create two distinct ways to play for our fans. While 3v3 is a quicker experience that is a bit more grounded in traditional streetball or pickup ball, we’ve decided to lean into the community feedback and make 5v5 a more competitive, traditional Pro-Am experience, with full five-minute quarters and fouls. Right here and now, we’re happy to introduce just that! 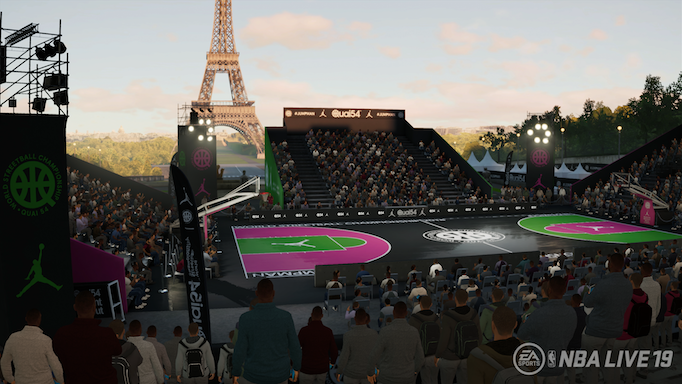 The Quai 54 in Paris, France home of the top global streetball tournament. The “Tenement” court inspired by the Court visited by both Lebron James and Paul George in Manilla Philippines. And finally, Margaret Lin Ding in Chicago. Not that anyone is following my personal NBA Live blog, but the game is now available to anyone with EA Access. If the Demo was any indication, II may end up spending an extra $5 during the trial period, as I will probably blow through my 10 hours in no time. For the first time, I'm really excited about a MyPlayer type mode in a sports game. It's kind of ridiculously good fun. In the demo I created an all too realistic version of myself. No, I didn't make my avatar fat and slow, but it is just 5'11". There were times when I looked like a freaking hobbit playing with others. But I created myself as a pass heavy point guard, and was able to dish assists, and even scored a fair amount. I didn't take a lot of shots, but my size did help lull defenders into forgetting about me. So I would suddenly drive the basket if there was a path and no one was ready. I even hit a couple of threes. The 5 on 5 and 3 on 3 is really well done. Would love it if some folks wanted to team up and play online some. Not sure if this game is going to get enough traction for that, as 2K is still way far ahead in many areas of the game. But like the old 2K sports games, Live just feels more fun to play than the established heavyweight. Can't say it is a better game, and all reports are that the franchise mode is still crap. As much as I like Ultimate Team modes, I feel like I may mostly skip LUT in this game, and just level up my avatar and play online in 5 on 5 and 3 on 3 pick-up games. And if not online, Court Battles is a massively cool single player mode that captures the fun of playing solo with and against CPU players. I liked the demo enough to believe that Madden is going to take a massive hit in playtime for me this year. That may change, but seriously, I'm pretty pumped for this game. As far as the MyPlayer mode goes can you choose which team you get to play for? The thing I like about last year's 2k is you got to choose the team. I hate having to spend a year or two playing for some random team that drafted me before I get to play for my team. I'm guessing the answer is yes. My player was drafted by the Knicks, but the first dialogue after that was your agent asking if you want to be traded, and then a list of teams. It might have been all of the teams, but I didn't really pay attention. I chose the Sixers and and got an instant confirmation that the trade went through. Oh, and after spending 5+ hours on the game today, I can tell you that Court Battles is indeed fantastic. I played some really cool variants. One game that went way too quick, but was fun was a match to 21, but the catch was that every missed shot put points in a bank. the next shot to go in was worth the shot, and all of the banked points. I ended up just running that team out of the building. They missed a three, I came back and hit a FG, which put me up 5-0. The CPU missed another three, and I scored another FG, going up 10-0 in two possessions. I think I won 21-4. Played one where threes were worth 4, jumpers - 3, layups-2 , and dunks -1. On the opposite, I played a match the opposite, with dunks worth 3, lay-ups and jumpers-2, and threes were only worth 1. On the first one, I got totally smoked the first time I played. Then I went into my line-up and looked at my available players and found some shooters. You can look at the rules before you play and choose your line-up. Also, you can see if your friends have a court to attack and go after them. So it's a cool way to see your friends courts, and it created a rivalry, since they will have to beat your squad to take their court back. I played the demo, 3 or 4 games. The basketball itself is not as bad as I expected. However, I don’t want to play every game with real people, and if there’s an option to play solo it is not obviously flagged. The issue isn’t that I’m antisocial. It’s that I always play a PF or C and no real people that play as guards ever pass to the bigs. Live regularly gets discounted to half price around Black Friday. I will consider it for the first time ever this year. In the regular game, I've been playing the EA Access trial, The One paths, The Street and The League, are both solo play. Court Battles, which, for me, is worth the price of admission, is also solo play, but instead of locked on, it is your avatar and four pros that you select from a roster you build, to take over other courts. All of that gameplay works toward leveling up your player, and it is never against live people. I've found the 5 on 5 to not be bad. I'm actually a guard that passes, but that's because I'm trying like hell to level my guy up, and assist matter. Played a 3 on 3 yesterday, and the two other guys pretty much ignored me. I busted through my 10 hours, and then bought another 10 using my wife's gamertag to buy a month of EA Access. And I have 2 hours left on that. The game drops tonight, I believe. Since the end of the MFL season, I've been playing this a ton again. 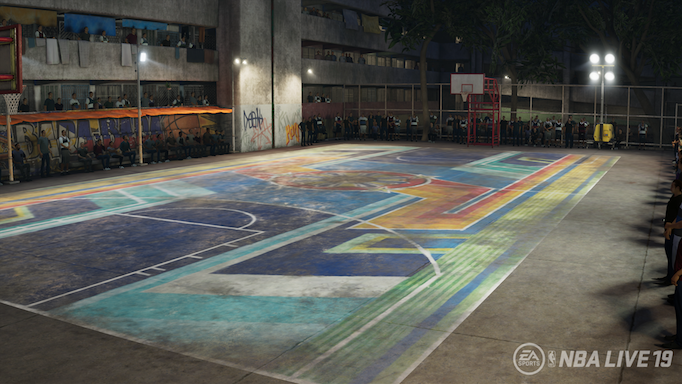 Seriously, they nailed down the MyCareer mode with fantastic playground modes. I'm leveling up my player, now to 53, by bouncing between The Streets, Live Run, and Live Events. My player is now a 5'10" PG that is progressing via the Jason Kidd Icon path. I'm mostly trying to level up passing and lay-ups, with steals and rebounding (especially key in 3v3 matches) getting some attention. Apparently developing as a Wing Scorer is the easiest path, but I like the idea of developing a role player, and trying to make it work as a very short PG. In Live matches, I've found that passing and accumulating some assists early is my best path. Opponents tend to lay off me as I never drive, until I do. Mid game I will start driving the baskets and getting some easy layups. Then, I start dishing as I drive. This would all work better as part of a regular team, but I've found online play to be mostly good. there are still a fair share fo ball hogs, but it does seem like most of the folks that stuck with NBA Live this long are playing better basketball. I had dabbled in this side on the 2K game, and it never kept my interest. This really feels night and day different. Still not playing any LUT. I like the UT modes in EA's games, but this one seems a bit unloved and forgotten, which is weird, since it is a revenue generator, and the One stuff is not. Maybe there is a way to pay money to level up your guy, but I have not run across it. Would love to play some hoops with others here. You can find the game pretty heap now, so if you are on XB1 and and want to play, hit me up. I could use tips and suggestions, as basketball has never been a sport I played a lot of. Never played in anything more than intramural leagues, and very, very little pick-up games. I enjoy watching basketball, but I struggle with many of the strategic concepts.